Metallothionein (MT) characterized by their low molecular weight and high cysteine content. 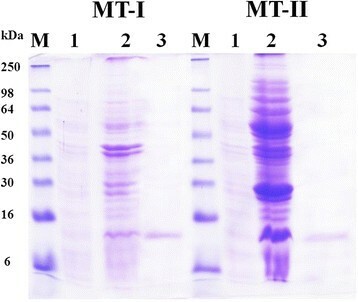 Two recombinant proteins of MT-I and MT-II overproduced in E. coli (M15) was purified by Ni2+-chelated affinity chromatography. The molecular mass of MT-I and MT-II are ca. 6,600 and 8,000 Da as determined by sodium dodecyl sulfate-polyacrylamide gel electrophoresis (SDS-PAGE). Total antioxidant status, DPPH radical scavenging activity, reducing power method, Fe2+-chelating ability, ferric thiocyanate (FTC) method, and protecting calf thymus DNA against hydroxyl radical-induced damage were studied. The MT-I and MT-II proteins with a concentration of 100 μg/mL exhibited the highest activity (expressed respectively as 61.72 ± 0.13 and 74.28 ± 1.15 μM Trolox equivalent antioxidative capacity, TEAC) in total antioxidant status test. 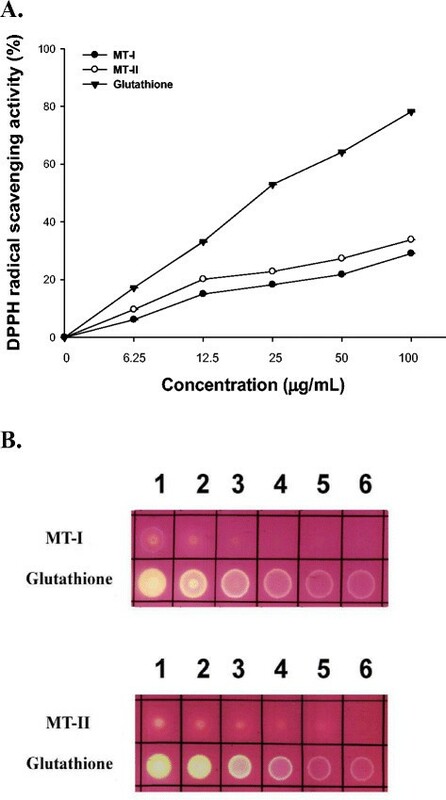 Like total antioxidant status, DPPH radical scavenging activity, reducing power, Fe2+-chelating ability, FTC activity, and protecting calf thymus DNA against hydroxyl radical-induced damage all showed that MT-1 and MT-II proteins have antioxidant activities. In this study, we also found that antioxidant activities of MT-I and MT-II increased from 17% and 16% (0 h) to about 26% and 28% (24 h) after 24 h hydrolysis by trypsin. Smaller peptides increased the antioxidant activities. Four and three peptides, respectively, from MT-I and MT-II protein sequences for testing antioxidative activity were synthesized according to tryptic hydrolysis simulation. The obtained MSSGCK, CGSDCK, LTLEGSSEK, ATEGGHACK, CGNGCGGCK, and CDPCNCK showed IC50 values of 309.87, 1423.37, 3925.54, 561.32, 300.76, and 610.12 μM, respectively, when scavenging activity of DPPH radicals (%) was measured. These findings mean that a cysteine residue is most important in antiradical activities. It was suggested that MT-I and MT-II might contribute their antioxidant activities against hydroxyl and peroxyl radicals. Recently, attention has been focused on a role for metallothionein (MT) as free radical scavenger. MT is a member of the low molecular weight protein family rich in cysteine and with the ability to coordinate heavy metal atoms (such as zinc, copper, and selenium). Plant MTs generally contain two smaller cysteine-rich domains (4-8 cysteines each) and a large spacer region (30-50 residues) devoid of this amino acid. The distribution of cysteine residues, as well as the length of the spacer region served to further classify plant MTs into four types (Huang et al. ). Expression of MT genes has been reported in a variety of plant tissues and has been proposed to function in metal homeostasis/detoxification, oxidative stress defense, salinity and carbonate stress, and development regulation (Sato and Bremner ). MT genes from sweet potato enhanced tolerance to heavy metals and abiotic stresses, which can be used for phytoremediation or tolerance to environmental stresses Chen et al. a, 2003b). In addition, the antioxidant function of MT is attributed to the presence of a large number of cysteine residues, which besides metal binding are also capable of reactive oxygen species (ROS) scavenging (Kumar et al. ). Plants are equipped with multiple enzymes and nonenzymatic molecules that are involved in the decomposition of ROS (Huang et al. ). Under normal conditions, the physiologically important intracellular levels of ROS are kept at low levels by various enzyme systems participating in the redox homeostasis. Therefore, oxidative stress can also be viewed as an imbalance between the prooxidants and antioxidants in the cell (Kehrer ). The ROS play an important role in the degenerative or pathological processes of various serious diseases, such as aging, cancer, coronary heart disease, Alzheimer’s disease, neurodegenerative disorders, atherosclerosis, and inflammation (Huang et al. ). During the past few years, natural antioxidants and compounds with radical scavenging activity have been found, such as phenolic compounds (Chang et al. ), Bowman-Birk Inhibitor (Huang et al. ), and trypsin inhibitor from sweet potato root (Huang et al. ). The objectives of this work were to investigate the antioxidant property of MT-I and MT-II from sweet potato tuberous root in comparison with chemical compounds such as butylated hydroxytoluene (BHT), reduced glutathione or ascorbate in a series of in vitro tests. Ascorbic acid, glutathione, DPPH (2, 2-diphenyl-1-picrylhydrazyl), EDTA (ethylenediaminetetraacetic acid), FTC (ferric thiocyanate), sodium bicarbonate, and Tris (hydroxylmethyl) aminomethane were purchased from Sigma-Aldrich Chemical Co. (St. Louis, MO USA). Total antioxidant status assay kit was purchased from Calbiochem-Novabiochem Corp (San Diego, California, USA). 95% ethanol was purchased from Riedel-de Haen Chemical Co. (Germany). Expression of MT-I and MT-II in E. coli. MT-I (AAD10220) and MT-II (FJ418632) with its pro-sequence were expressed in E. coli. The coding sequence was amplified from cDNA MT-I and MT-II using an oligonucleotide (MT-I, 5′-GGA TCC AGA GAT GTC TTC CGG TTG C −3′; MT-II, 5′-GGA TCC AAA AAT GTC TTG CTG TG-3′), with a Bam HI site (underlined) at the putative initial Met residue, and an oligonucleotide (MT-I, 5′- GAC CCT TGC AAC TGT AAG CTT CAA −3′; MT-II, 5′- GCA ATT GCA AGT GAG ATG CGAA G CTT −3′), with a Hind III site at the 3′ end. The PCR fragment was subcloned in pGEM T-easy vector. The plasmid was then digested with Bam HI and Hind III and the excised fragments were subcloned in pQE31 expression vector (QIAexpress expression system, Qiagen). The resulting plasmid, termed pQE-MT-1 and pQE-MT-II, was introduced into E. coli (M15). Cultures of the transformed E. coli (M15) each overexpressed a protein of the expected molecular mass, which was purified by affinity chromatography in Ni-nitrilotriacetic acid (NTA) columns (Qiagen), according to the manufacturer’s instructions. MT-I and MT-II were detected on 15% SDS-PAGE gels. Samples treated with sample buffer and β-mercaptoethanol (2-ME) with a final concentration of 14.4 mM were heated at 100°C for 5 min before 15% SDS-PAGE. Total antioxidant status of the MT-I and MT-II protein was measured using the total antioxidant status assay kit (Calbiochem-Novabiochem Corp) with reduced glutathione as a positive control according to the manufacturer’s instructions. The assay relies on the antioxidant ability of the protein to inhibit oxidation of 2, 2′ azino-bis-[3-ethylbenz-thiazoline-6-sulfonic acid] (ABTS) to ABTS*+ by metmyoglobin. The amount of ABTS*+ produced is monitored by reading the absorbance at 600 nm. Under these reaction conditions, the antioxidant ability of MT-I and MT-II protein decreases the absorbance at 600 nm in proportion to its concentration. The final antioxidant capacity of MT-I and MT-II protein were calculated by the following formula: Trolox equivalent value(mmol/L) = [factor × (absorbance of blank - absorbance of sample)]; factor = [concentration of standard/(absorbance of blank-absorbance of standard)]. An aliquot (3 μL) of each diluted sample of MT-I and MT-II was carefully loaded on a 20 cm × 20 cm TLC layer (silica gel 60F254; Merck) and allowed to dry (3 min). Drops of each sample were loaded in order of decreasing concentration along the row. The staining of the silica plate was based on the procedure of Huang et al. (). The sheet bearing the dry spots was placed upside down for 10 s in a 0.4 mM DPPH solution. Then the excess of solution was removed with a tissue paper and the layer was dried with a hair-dryer blowing cold air. Stained silica layer revealed a purple background with white spots at the location where radical scavenger capacity presented. The intensity of the white color depends upon the amount and nature of radical scavenger present in the sample. The reducing powers of MT-I or MT-II were determined with ascorbic acid as a positive control according to the method of Huang et al. (). MT-I and MT-II (0, 0.2, 0.4, 0.6, 0.8, and 1.0 mg/mL) or ascorbic acid was mixed with an equal volume of 0.2 M phosphate buffer, pH 6.6, and 1% potassium ferricyanide. The mixture was incubated at 50°C for 20 min, during which time ferricyanide was reduced to ferrocyanide. Then an equal volume of 1% trichloroacetic acid was added to the mixture, which was then centrifuged at 6,000 g for 10 min. The upper layer of the solution was mixed with deionized water and 0.1% FeCl3 at a ratio of 1:1:2, and the absorbance at 700 nm was measured to determine the amount of ferric ferrocyanide (Prussian Blue) formed. Increased absorbance of the reaction mixture indicated increased reducing power of the sample. The FTC method was adapted from the method of Osawa and Namiki (). Twenty mg/mL of samples dissolved in 4 ml of 99.5% (w/v) ethanol were mixed with linoleic acid (2.51%, v/v) in 99.5% (w/v) ethanol (4.1 mL), 0.05 M phosphate buffer pH 7.0 (8 mL) and deionized water (3.9 mL) and kept in a screw-cap container at 40°C in the dark. Then, to 0.1 mL of this solution was added 9.7 mL of 75% (v/v) ethanol and 0.1 mL of 30% (w/v) ammonium thiocyanate. Precisely 3 min after the addition of 0.1 mL of 20 mM ferrous chloride in 3.5% (v/v) hydrochloric acid to the reaction mixture, the absorbance at 500 nm of the resulting red color [Fe (SCN)2+, Fe3+ was formed after linoleic acid peroxide was produced and Fenton reaction occurred.] was measured every 24 h until the day when the absorbance of the control reached the maximum value. The inhibition of linoleic acid peroxidation was calculated as (%)inhibition = 100 - [(absorbance increase of the sample/absorbance increase of the control) × 100]. All tests were run in duplicate and analyses of all samples were run in triplicate and averaged. The hydroxyl radical was generated by Fenton reaction according to the method of Kohno et al. (). The 15 μL reaction mixture containing MT-I or MT-II (2.5, 5, and 10 mg/mL), 5 μL of calf thymus DNA (1 mg/mL), 18 mM FeSO4, and 60 mM hydrogen peroxide were incubated at room temperature for 15 min. Then 2 μL of 1 mM EDTA was added to stop the reaction. Blank test contained only calf thymus DNA and the control test contained all reaction components except MT-I or MT-II. 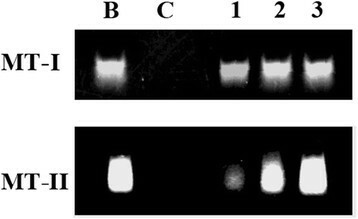 The treated DNA solutions were subjected to agarose electrophoresis and then stained with ethidium bromide and examined under UV light. Six mg of MT-I or MT-II were dissolved in 1 mL of 0.1 M KCl buffer (pH 2.0). Then 0.1 mL (12 mg) of trypsin was added at 37°C for 0 and 24 h. After hydrolysis, 0.5 mL of 0.5 M Tris–HCl buffer (pH 8.3) was added, and the solution was heated at 100°C for 5 min to stop enzyme reaction. The trypsin was heated before MT-I or MT-II hydrolysis for the 0 h reaction. Each of the 60 μL MT-I or MT-II hydrolyzates was used for determinations of the DPPH antioxidative activities by spectrophotometry. The unhydrolyzed MT-I or MT-II and tryptic MT-I or MT-II hydrolyzates at 24 h were separated by Sephadex G-50 chromatography (1 × 60 cm). The column was eluted with 20 mM Tris-HCl buffer (pH 7.9). The flow rate was 30 mL/h, and each fraction contained 2 mL of which the absorbance at 280 nm was then determined. Means of triplicates were calculated. Student’s t test was used for comparison between two treatments. All data (expressed as percent of control value) were means ± SE. A difference was considered to be statistically significant when p < 0.05, p < 0.01 or p < 0.001. SDS-PAGE analysis of MT-I and MT-II crude extracts from the transformed E. coli (M15) showed high amounts of a polypeptide with the expected molecular mass (ca. 6.5 and 8 kDa, respectively) (Figure 1). MT-I or MT-II was found as a soluble protein in the supernatant (Figure 1, lane 2), and was absent in protein extracts obtained from E. coli transformed with pQE-31 vector (Figure 1, lane 1). The expressed protein was highly purified from crude extracts as His-tagged pQE-MT-1 or pQE-MT-II (Figure 1, lane 3). Purified recombinant sweet potato MT-I and MT-II proteins. Crude extracts (5 μg protein) from E. coli (M15) transformed with pQE30 (lane 1) or with pQE31- MT-I (lane 2) or pQE31- MT-II (lane 2) were analyzed by 15% (w/v) SDS-PAGE, and then the gels were stained with Coomassie brilliant blue G-250. Molecular masses of standard proteins were indicated at the left of the figure. His-tagged MT-I protein or MT-II (lane 3) was purified by Ni2+-chelated affinity chromatography. “M” indicated the see Blue™ pre-stained markers for SDS-PAGE. Each data show the mean ± SD of one experiment performed in triplicate. This was done using the total antioxidant status assay kit (Figure 2). 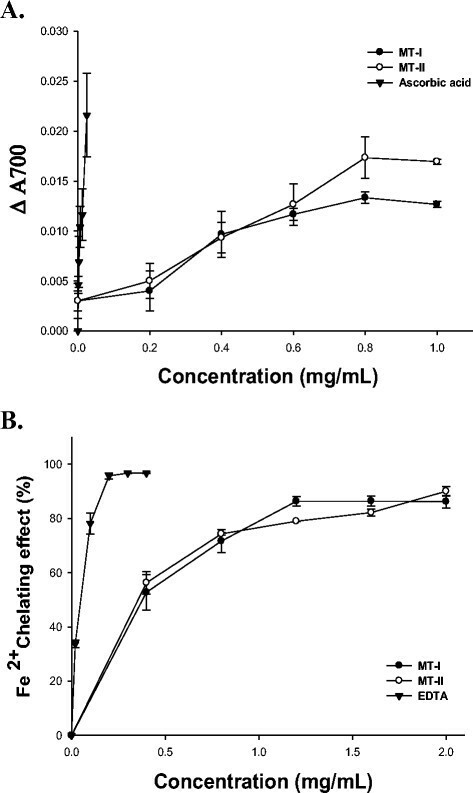 MT-I or MT-II protein exhibited a dose-dependent total antioxidant activity (to prevent the formation of ABTS· +) within the applied concentrations (0, 6.25, 12.5, 25, 50, and 100 μg/mL), the highest at 100 μg/mL (expressed, respectively, as 61.72 ± 0.13 and 74.28 ± 1.15 μM Trolox equivalent antioxidative capacity, TEAC). The inhibition of the formation of ABTS ·+ by MT-I and MT-II proteins from sweet potato tuberous roots. Glutathione was used as a positive control. Each value represented mean ± S.D. of three parallel measurements. The DPPH radical was widely used in the model system to investigate the scavenging activities of several natural compounds (Huang et al. ). DPPH radical is scavenged by antioxidants through the donation of a hydrogen forming the reduced DPPH-H. 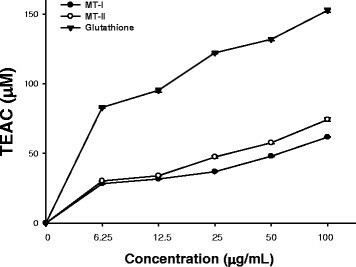 Figure 3A shows the dose-response curve for the radical-scavenging activity of MT-I and MT-II compared with glutathione at the different concentrations by using the DPPH coloring method. It was found that MT-I and MT-II had the highest radical-scavenging activity (29.06 ± 0.03 and 33.83 ± 0.02%, respectively) at 100 μg/mL. Due to the ability of thiols to undergo redox reactions, free cysteine residue has antioxidant properties. Free cysteine residues were reported to have antioxidant activities in whey proteins and trypsin inhibitor from sweet potato (Allen and Wrieden ). Our findings suggest that cysteine residues in MT-I and MT-II might also participate in antiradical activity. DPPH radical scavenging activity and dot blot assay of MT-I and MT-II proteins from sweet potato tuberous roots. MT-I and MT-II proteins were tested for scavenging activities of DPPH radical (A). Glutathione was used as a positive control. Dot blot assay on a silica sheet stained with a DPPH solution in methanol (B). From left to right dots are: Each 3 μL plant extract (200, 100, 50, 25, and 12.5 μg/mL protein) applied from leaf to right. Each 3 μL GSH (10, 5, 2.5, 12.5, and 6.25 μg/mL) applied from left to right. Antioxidant capacity of MT-I and MT-II were eye-detected semi-quantitatively by a rapid DPPH staining method using TLC. Each diluted sample was applied as a dot on a TLC layer that was then stained with DPPH solution (Figure 3B). The appearance of white color spot vs a purple background has a potential value for the indirect evaluation of antioxidant capability of MT-I and MT-II in the dot blots (Chang et al. ). Fast-reacted and strong intensities of white spots appeared up to the dilution of 50 μg/ MT-I /mL and 12.5 μg/ MT-II /mL (with an absolute amount of 0.15 μg and 0.0375 μg, respectively). We investigated the Fe3+-Fe2+ transformation in the presence of the samples of MT-I or MT-II to measure its reducing capacity. The reducing capacity of a compound may serve as a significant indicator of its potential antioxidant activity (Meir et al. ). The reducing power of MT-I or MT-II is shown in Figure 4A with ascorbic acid served as a positive control. The reducing power activity of MT-I and MT-II exhibited a dose-dependence manner within the applied concentrations (0, 0.2, 0.4, 0.6, 0.8, and 1.0 mg/mL). Antioxidative activities of MT-I and MT-II proteins from sweet potato tuberous roots, as measured by the reducing power (A) and Fe 2+ -chelating ability method (B). Ascorbic acid and EDTA, respectively, were used as the positive controls. Each value represented mean ± S.D. of three parallel measurements. The metal chelating capacity of MT-I, MT-II was determined by assessing their ability to compete with ferrozine for the ferrous ions with EDTA as a positive control (Figure 4B). The Fe2+-chelating ability of MT-I and MT-II were lower than that of EDTA. MT-I and MT-II at 2 mg/mL exhibited 86.18 ± 2.31% and 90.02 ± 1.66% iron binding capacity, respectively. On the other hand, EDTA at 0.4 mg/mL had 96.68 ± 0.13% chelating activity of iron. In FTC method, the amount of peroxide at the initial stage of lipid peroxidation was determined. During the linoleic acid oxidation, peroxides are formed, which oxidize Fe+2 to Fe+3. The formed Fe+3 ions complexes with thiocyanate ions (SCN-), which has a maximum absorbance at 500 nm (Zou et al. ). Therefore, prevention of lipid peroxidation is an important function of antioxidants. 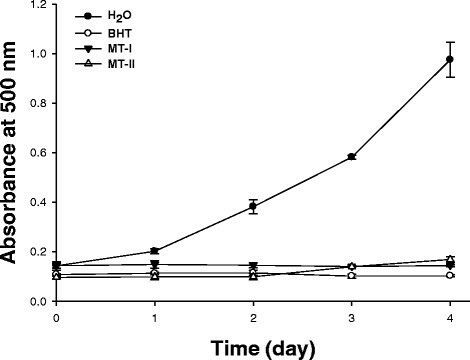 Figure 5 shows the time-course curve for the antioxidative activity of the MT-I and MT-II, BHT (a positive control), and H2O (a negative control) by the FTC method. The results indicate that both MT-I and MT-II have antioxidative activity. MT-I and MT-II may act as a significant lipid peroxidation inhibitor. Inhibition of linoleic peroxidation by MT-I and MT-II proteins from sweet potato, as measured by the FTC method. Each absorbance value represents average of triplicates of different samples analyzed. Oxidative DNA damage has been implicated to be involved in various degenerative diseases, DNA damage is a crucial event in metazoan life cycle since it poses a situation where the cells have to decide between repair and cell death (Kohno et al. ). Figure 6 shows that MT-I or MT-II protected against hydroxyl radical-induced calf thymus DNA damages. The blank contained calf thymus DNA only and the control contained all components except MT-I or MT-II. Compared to the blank and control, it was found that 2.5 mg/mL MT-I or MT-II could protect against hydroxyl radical induced calf thymus DNA damages during 15-min reactions. Protection against hydroxyl radical-induced calf thymus DNA damage by oxidized and reduced form of MT-I and MT-II proteins from sweet potato tuberous roots. Lanes 1-3 were 2.5, 5, and 10 mg/mL MT-I and MT-II additions. Only calf thymus DNA was used for blank test (B), and the control test was without MT-I and MT-II additions (C). We used trypsin to hydrolyze MT-I or MT-II to mimic the hydrolysis course during digestion in human’s (or animal’s) intestine. 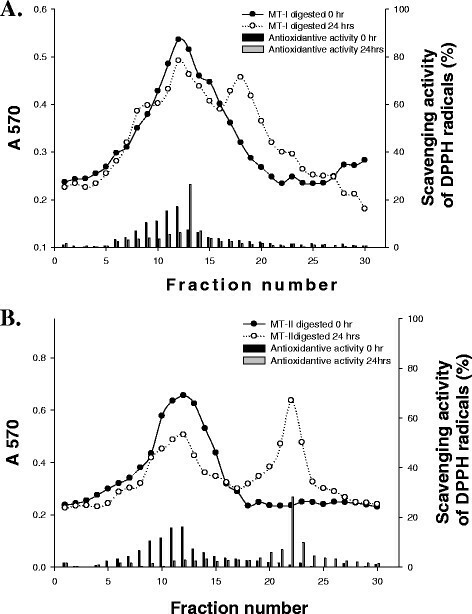 Figure 7A and B shows the antioxidative activity of tryptic MT-I or MT-II hydrolyzates and the antioxidative activity (scavenging activity of DPPH radical, percent) of tryptic MT-I or MT-II hydrolyzates collected at different trypsin hydrolysis times. Antioxidative activity of recombinant MT-I and MT-II tryptic hydrolyzates. The plot shows the antioxidative activity (%) of MT-I and MT-II hydrolyzates at different trypsin hydrolysis time (0 hr and 24 hr). The proteins and the scavenging activity of DPPH radicals (%) were shown. The scavenging effect (%) was calculated according to the equation [1 - (Abs 517 nm of sample ÷ Abs 517 nm of control)] × 100%. Antioxidative activity of recombinant MT-I (A) and MT-II (B) tryptic hydrolyzates. From the results, it was found that the antioxidative activity increased, respectively, from 17% and 16% (0 h) to about 26% and 28% (24 h). It was found that smaller peptides increased with trypsin hydrolytic time. The purifications of potential peptides of antioxidative activity need further investigations. We used synthetic peptides to measure antioxidative activity. Synthetic peptides were designed by simulating trypsin cutting sites of MT-I and MT-II gene products from sweet potato (http://web.expasy.org/peptide_cutter/). The obtained MSSGCK, CGSDCK, LTLEGSSEK, ATEGGHACK, CGNGCGGCK, and CDPCNCK showed IC50 values of 309.87, 1423.37, 3925.54, 561.32, 300.76, and 610.12 μM, respectively, when scavenging activity of DPPH radicals (%) was measured (Table 1). Cysteine residues with free-SH in whey proteins (McPherson and Hardy ) were reported to have antioxidant activities. A number of studies have proved that the cysteine ligands in proteins are also remarkably reactive towards oxidizing agents (Hao and Maret ), including MTs (Maret ). Therefore, it could be concluded that MT-I or MT-II acts as an endogenous antioxidant to respond to ROS stress in a direct manner. Our results further indicate that cysteine residues (MSSGCK and CGNGCGGCK) in sweet potato MT-I and MT-II contribute to the antiradical activity. In addition, several amino acids, such as Tyr (Y), Met (M), His (H), Lys (K), and Trp (W), may significantly contribute to the antioxidant activity of the hydrolyzates (Chen et al. ). The synthetic peptides MSSGCK and CGNGCGGCK, have the highest antioxidant activity (with IC50 309.87 and 300.76 μM, respectively) while reduced glutathione has IC50 74.84 μM). These results demonstrated that simulated synthetic peptides from peptic MT-I or MT-II hydrolyzates exhibited antioxidative activity. In conclusion, the results from in vitro experiments, including total antioxidant status assay, DPPH radical scavenging activity, reducing power method, Fe2+-chelating ability, FTC method, and hydroxyl radical-induced calf thymus DNA damage, demonstrated that MT-I and MT-II in sweet potato tuberous root may have significant antioxidant activities. MT-I and MT-II may contribute significantly to change the redox states and as a potent antioxidant against both hydroxyl and peroxyl radicals when people consume sweet potato. The antioxidant activity of MT-I and MT-II should be performed in vivo in near future. S-SH and J-SD carried out the gene expressions and the antioxidant studies. H-JC, Y-HL and G-J design an experiment and writing a research paper. All authors read and approved the final manuscript. The authors want to thank the financial supports from the National Science Council (NSC101-2313-B-039-002-MY3, NSC102-2320-B-039-022, and NSC102-2320-B-468-004), China Medical University (CMU) (CMU102-N-06, CMU101-N1-01, and CMU101-AWARD-08), Asia University (100-ASIA-15), and Taiwan Department of Heath Clinical Trial and Research Center of Excellence (DOH102-TD-B-111-004).